Leah Hogsten | The Salt Lake Tribune Murray's Jaden Durfee returns the punt before getting tackled by Skyline's Trace Kaelin. Murray High School defeated Skyline High School during their play-in game at Cottonwood High school, Tuesday, Oct. 23, 2018. Murray play in the playoffs as the 4th seed against Corner Canyon. Leah Hogsten | The Salt Lake Tribune Murray's quarterback Payton Hadley. Murray High School defeated Skyline High School during their play-in game at Cottonwood High school, Tuesday, Oct. 23, 2018. Murray play in the playoffs as the 4th seed against Corner Canyon. Leah Hogsten | The Salt Lake Tribune Murray's Owen Madsen and Autjoe Soe celebrate Madsen's touchdown. Murray High School defeated Skyline High School during their play-in game at Cottonwood High school, Tuesday, Oct. 23, 2018. Murray play in the playoffs as the 4th seed against Corner Canyon. Leah Hogsten | The Salt Lake Tribune Murray celebrates the win. Murray High School defeated Skyline High School during their play-in game at Cottonwood High school, Tuesday, Oct. 23, 2018. Murray play in the playoffs as the 4th seed against Corner Canyon. Leah Hogsten | The Salt Lake Tribune Murray High School defeated Skyline High School during their play-in game at Cottonwood High school, Tuesday, Oct. 23, 2018. Murray play in the playoffs as the 4th seed against Corner Canyon. Leah Hogsten | The Salt Lake Tribune Skyline's Ammon Nemelka brings down Murray's Logan Jones. Murray High School defeated Skyline High School during their play-in game at Cottonwood High school, Tuesday, Oct. 23, 2018. Murray play in the playoffs as the 4th seed against Corner Canyon. 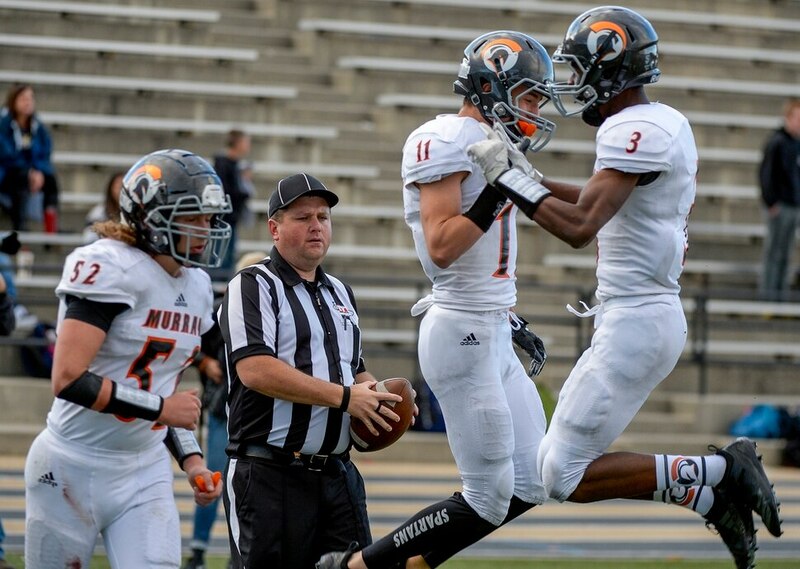 Leah Hogsten | The Salt Lake Tribune Skyline's Hayden Hansen celebrates his touchdown with Isaac Campbell. Murray High School defeated Skyline High School during their play-in game at Cottonwood High school, Tuesday, Oct. 23, 2018. Murray play in the playoffs as the 4th seed against Corner Canyon. Leah Hogsten | The Salt Lake Tribune Skyline's Jeremiah Johnson with the touchdown. Murray High School defeated Skyline High School during their play-in game at Cottonwood High school, Tuesday, Oct. 23, 2018. Murray play in the playoffs as the 4th seed against Corner Canyon. Leah Hogsten | The Salt Lake Tribune Skyline's Hayden Hansen pulls down the easy catch for the touchdown. Murray High School defeated Skyline High School during their play-in game at Cottonwood High school, Tuesday, Oct. 23, 2018. Murray play in the playoffs as the 4th seed against Corner Canyon. Leah Hogsten | The Salt Lake Tribune Murray High boosters celebrate the win. Murray High School defeated Skyline High School during their play-in game at Cottonwood High school, Tuesday, Oct. 23, 2018. Murray play in the playoffs as the 4th seed against Corner Canyon. Leah Hogsten | The Salt Lake Tribune Murray High School defeated Skyline High School during their play-in game at Cottonwood High school, Tuesday, Oct. 23, 2018. Murray play in the playoffs as the 4th seed against Corner Canyon. 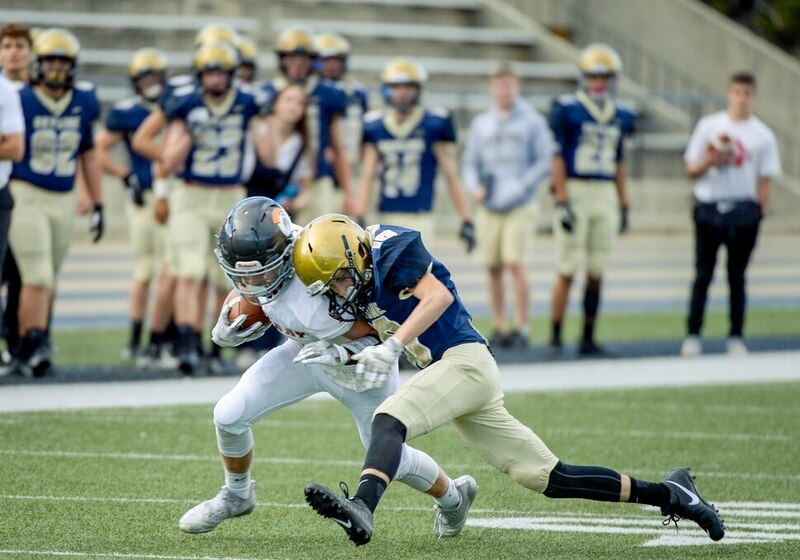 Leah Hogsten | The Salt Lake Tribune Murray's Jaden Durfee with the touchdown. Murray High School defeated Skyline High School during their play-in game at Cottonwood High school, Tuesday, Oct. 23, 2018. Murray play in the playoffs as the 4th seed against Corner Canyon. Leah Hogsten | The Salt Lake Tribune Murray celebrates the win. Murray High School defeated Skyline High School during their play-in game at Cottonwood High school, Tuesday, Oct. 23, 2018. Murray play in the playoffs as the 4th seed against Corner Canyon. Leah Hogsten | The Salt Lake Tribune Murray's Durrant Sinju and Jason Horman stop Skyline's Ben Campbell. Murray High School defeated Skyline High School during their play-in game at Cottonwood High school, Tuesday, Oct. 23, 2018. Murray play in the playoffs as the 4th seed against Corner Canyon. Leah Hogsten | The Salt Lake Tribune Skyline's Jacob Walker and Cameron Sueoka stop Murray's Shayne Zullo. Murray High School defeated Skyline High School during their play-in game at Cottonwood High school, Tuesday, Oct. 23, 2018. Murray play in the playoffs as the 4th seed against Corner Canyon. Leah Hogsten | The Salt Lake Tribune Murray's Shayne Zullo and Autjoe Soe react to Skyline's touchdown by Jeremiah Johnson. Murray High School defeated Skyline High School during their play-in game at Cottonwood High school, Tuesday, Oct. 23, 2018. Murray play in the playoffs as the 4th seed against Corner Canyon. Leah Hogsten | The Salt Lake Tribune Murray's Owen Madsen pulls in the interception to win the game. Murray High School defeated Skyline High School during their play-in game at Cottonwood High school, Tuesday, Oct. 23, 2018. Murray play in the playoffs as the 4th seed against Corner Canyon. Murray • On the surface, they’re not unlike other high school football games. Players execute pass and run plays. They kick extra points after touchdowns. They’re constantly told by referees to keep the required distance from the sideline. But Tuesday’s games were unlike any other in this respect: They only lasted one half, and were that short in order to settle a three-way tie for fourth place to determine which of Murray, West and Skyline high schools would advance to the Utah High School Activities Association Class 5A State Football Championships. Murray, West and Skyline each finished with a 1-4 record in their region. In the event of a three-way tie, the rule is those three teams play each other for one half. The winner of the first half faces the team that was awarded a bye via a previously decided coin toss. The team that wins the second half would make the playoffs. Murray, which defeated West 24-21 in the first half, beat Skyline 17-14 in the second and advanced to the playoffs. In both, Murray kicked a field goal in the fourth quarter to eclipse its opponent. The format presents some unique challenges. Skyline head coach Zac Erekson on Monday called the situation “a lose-lose” from a preparation standpoint. The teams learned the results of the coin flip last Wednesday, when representatives of all three schools gathered at Skyline to witness the results. That day was also the last day of school before fall break, which gave each team less than a week to prepare for their play-in game. Because Skyline drew tails and the other two schools drew heads, Skyline won the toss and got to wait to see whether Murray or West would come out of the first-half game. But Erekson didn’t see the result as much of an advantage after initially feeling relief. He said having to prepare for two teams, which he described as different schematically, took away any advantage that could be gained by not having to play two halves. “It’s a blessing and a curse,” Erekson said. When Skyline kicked off to start the second half, however, it felt just like any other game, Erekson said Tuesday. Well, with one caveat: figuring out whether to wear home or away jerseys without knowing who had won the first half. Murray and West both felt differently than Erekson about the challenges of preparing for two opponents. 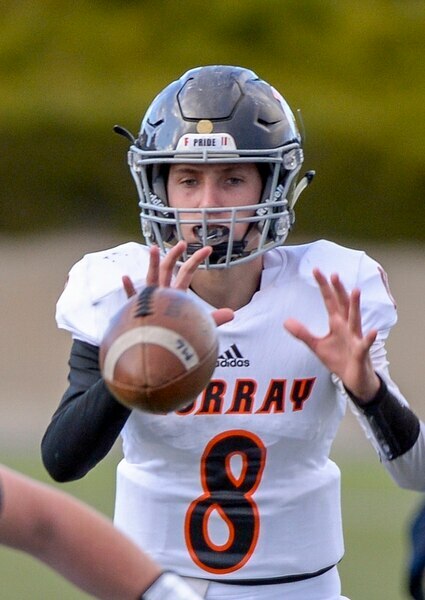 Murray coach Todd Thompson said Monday that Skyline and West’s offenses and defenses were similar, which gave Murray the opportunity to, in effect, prepare for both at the same time. West coach Justin Thompson concurred. West junior quarterback Abraham Williams said he felt no difference in preparing for Tuesday’s game. He added that the team focused mostly on winning the game against Murray. But as the game went on, what Justin Thompson found notable on Tuesday was what adjustments came when. Midway through the second quarter, he found himself caught in between figuring out whether to play faster to earn an extra possession, or play slower and draw out the clock. West’s offense was affected by the truncated format, Justin Thompson said. He wanted to call a few special plays early in the game in order to get a quick lead. But West couldn’t execute those plays when they were called. All three touchdowns it scored came off its base offense, on the same play, Justin Thompson said. With not much time allowed, each team’s coach stressed the importance of getting off to good starts. Murray was the beneficiary of winning both coin tosses and chose to receive the ball in each instance. Murray scored its first touchdown in 56 seconds against West, and in 1 minute, 4 seconds against Skyline. Todd Thompson said he was glad his team won the first-half game and thought that gave Murray a lift it needed to beat Skyline and make the playoffs.